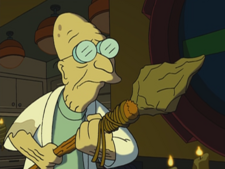 The pointy rock tied to a stick was a spear invented by Professor Farnsworth when all of technology rebelled and he couldn't invent any machinery. He was going to use it to help steal fire from Pottery Barn. However, the rock fell off and broke soon after it was invented. It was later used by the Crapface Fellows in a post-apolalypctic New New York in the year 10000. This page was last edited on 14 August 2012, at 13:57.